Until I saw this book I suppose I never truly realized how ingrained the use of flowers and plants are in Lao religious ceremonies and the meaning that they carry. If you've grown up around such things in Lao culture, you probably wouldn't question it or even stop to really think about it. This book made me think. It certainly made me appreciate how plants and, in particular, flowers are utilized in Laos. With its plentiful and beautiful photos, illustrations and insightful text, it goes into many areas providing extensive background and understanding of why/how/which flowers are used and for what occasion or purpose. For example, it shows how flower designs permeate even temple art and motifs, to how fruits are used, to how bailan is utilized to the flowers that are used for specific occasions like a sukuan or perhaps during a death ceremony. 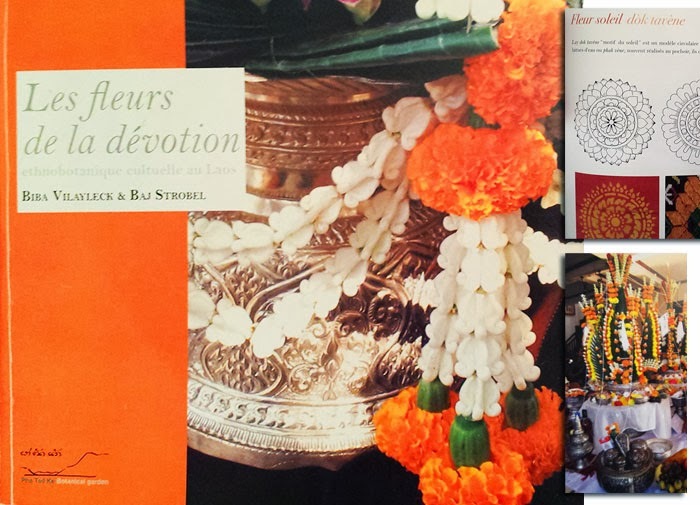 It also lists all plants and flowers by their botanical name, in Lao and French. It covers all that and much more! And it's beautifully photographed. The writers are with the Pha Tat Ke Botanical Garden (pha-tat-ke.com). This wonderfully informative book took 2 years to complete. In it, 140 plants described, 304 pages, and 339 illustrations. Full table of contents are noted below. I highly recommend this book. And yes it is in French with some Lao. Alors avec espoir, vous pouvez lire en français! Very kind of you to say! Thank you very much.